I’ve decided that I have far too much to say about this wonderful book for just one blog post, so I’m going to be writing a series of my posts throughout my P&P reread. This first post, for example, consists of a brief background history of the novel and my thoughts on Chapter One. Other posts may include my thoughts on a couple of chapters or perhaps an in-depth look at one of the characters. I’m not going into this reread with any definite and structured plans, because I know that if I make definite and structured plans I won’t stick to them anyhow, so why bother going to all that effort? Anyhow, I’ll stop rambling and we’ll get onto the book now, shall we? Quick Note: All of the historical and factual information included in this post comes from The Annotated Pride and Prejudice by David M. Shapard, which is a wonderful book for anyone interested in delving a bit deeper into the story and history of the period. The novel readers know and love today as Pride and Prejudice was almost published under a completely different title. Jane Austen had been writing short sketches since the age of thirteen, and at the age of nineteen she wrote her first complete novel, Elinor and Marianne. A year later, between 1796 and 1797, Austen wrote a second novel, this one titled First Impressions. Her family was pleased with the novel and sent it off to publishers, however it was met with rejection and Austen subsequently took a break from writing due to extenuating family circumstances. After moving to the small Hampshire town of Chawton in 1809, Austen decided to return to her writing and rework some of her earlier pieces. 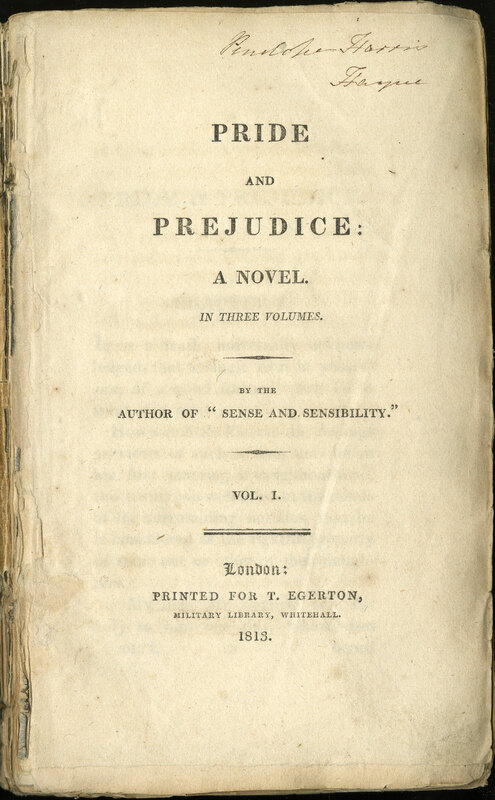 Elinor and Marianne was published in 1811 under the new title of Sense and Sensibility, and two years later, in 1813, First Impressions became Pride and Prejudice. Jane Austen doesn’t mess around – in just two sentences, she sums up the basic premise of Pride and Prejudice’s plot. A man who is both rich and single must, whether he is consciously aware of the fact or not, be looking for a wife, and all of the nearby families are more than happy to offer up their daughters for the position. Marriage is an important theme that will crop up again and again throughout Pride and Prejudice, and many of the pivotal moments in this book are defined by either a rejected or an accepted proposal of marriage. Another important theme in this book is the distinction between marrying for wealth and status, which was the common motivation in 18th century England, versus marrying for love, which is a view that sets Elizabeth Bennet and other Austen heroines apart from the majority of the other women in their time. But I digress, we haven’t even been introduced to Lizzy yet! Back to Chapter One. A couple of very important things happen in the three short pages that comprise Chapter One: we are introduced to a married couple named Mr. and Mrs. Bennet, and we learn that a young man named Bingley of “four or five thousand a year” is moving into Netherfield Park. One of Austen’s particular strengths as a novelist is dialogue, and her novels are filled with page after page of witty conversation. In fact, this first chapter of Pride and Prejudice is almost all dialogue. We aren’t really given any background information on Mr. and Mrs. Bennet, yet we enter Chapter Two with a very clear picture of what they’re like as characters through their speech. Austen is quite brilliant at presenting her characters through dialogue, and it is one of the things I love most about her writing. As I mentioned before, the second important piece of information revealed in Chapter One is that a young named Bingley is moving into a nearby house by the name of Netherfield Park. As evidence of how quickly gossip travels in Regency Era England, Bingley hasn’t even moved in yet and Mrs. Bennet already knows how old he is, by what means he traveled to the property, when he is planning on moving in, and how much his annual income is worth. In the novel Mrs. Bennet mentions that Bingley has a “large fortune of four or five thousand a year,” which in modern times is about £150,000-£200,000 (or $250,000-$300,000) a year. In other words, Bingley got bands (I’ll go now, shall I?). Bingley would be a good catch for any young woman, and so Mrs. Bennet is pestering her husband to go around and introduce himself, as social customs of the time dictated that Mr. Bennet, as the man of the house, should make the initial introduction. All of Mr. Bennet’s wealth and property will go to his cousin, Mr. Collins (not introduced yet), upon his death, so a prosperous marriage is the best way to secure a decent future for the Bennet girls. Mrs. Bennet’s anxiety over her daughter’s marriages then, while slightly annoying, is just an extreme manifestation of her concern for her daughters. Mr. Bennet’s sarcastic indifference throughout this chapter, although it may show his wit and humor, is a bit too far on the other end of the scale: Mrs. Bennet is too over the top, and Mr. Bennet is far too relaxed when it comes to his daughters’ futures. The last major point I feel I need to address in Chapter One is the differing ways in which Mr. and Mrs. Bennet view their children and what this says about their differing opinions on marriage and society. When Mrs. Bennet asks Mr. Bennet to visit Bingley he says that instead of visiting himself, he will send them with a few lines of introduction with “a good word for my little Lizzy.” We quickly learn that, out of his five daughters, Mr. Bennet has a special soft spot for Lizzy, claiming that she “has something more of quickness than her sisters.” Mr. Bennet places more value on thought and mental abilities than beauty and wealth, and thus we will soon find that he subscribes to the view of marrying for love. Mrs. Bennet, on the other hand, who dreams only of finding her daughters wealthy husbands, cries that Lizzy “is not half so handsome as Jane, nor half so good humoured as Lydia.” In her mind, these are the attributes that are most likely to attract a husband, so they are the traits she most admires in her own daughters. So there we have it – in just three short pages, Austen addresses the somewhat unforgiving realities of the society in which the story takes place, establishes marriage as a central theme, and introduces both the Bennet family and Mr. Bingley. Not bad for a single chapter, eh?